2. Cook cheese tortellini according to package directions, drain and set aside. 3. Heat a 12-inch cast iron skillet over medium-high heat. Add oil and sauté chopped onion and garlic until soft and translucent. Add spinach to onion mixture and cook until wilted. Remove from pan. 4. Add ground venison to skillet and cook until browned. 5. Stir in tomatoes, basil, oregano, garlic powder, salt, onions and spinach. 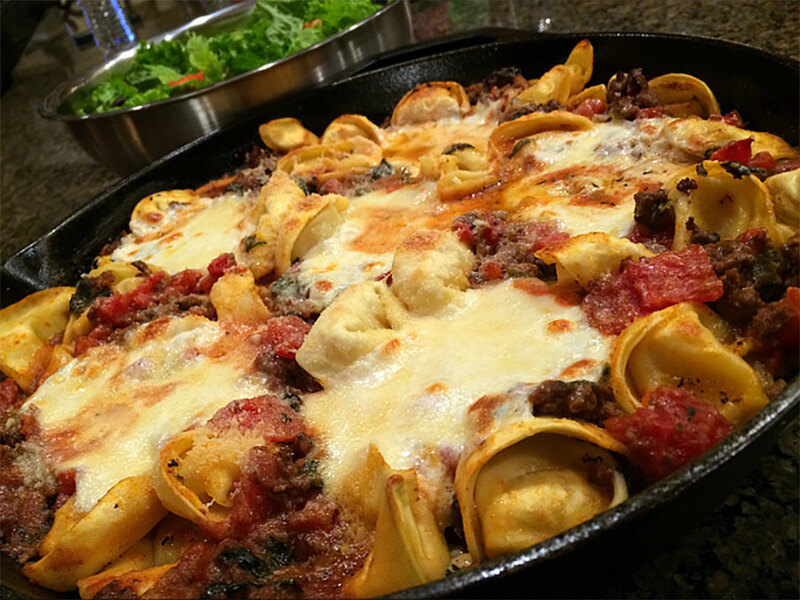 Add cooked tortellini to skillet and gently mix ingredients together. 6. Top with 1/4-thick slices of fresh mozzarella cheese. Sprinkle with Romano and Parmesan cheeses. 7. Cover loosely with foil and bake for 20 minutes. 8. Remove foil and continue cooking until heated through completely.